Suzanne R. Hoover *↤ Suzanne R. Hoover has taught at the City College of New York and at Wellesley College. She has contributed previously to the Newsletter. She is presently in London studying English Romantic art on a fellowship from the National Endowment for the Humanities. “At the Manchester Art-Treasures Exhibition of 1857, among the select thousand water-colour drawings, hung two modestly tinted designs by Blake, of few inches in size . . . Both are remarkable displays of imaginative power, and finished examples in the artist’s peculiar manner. Both were unnoticed in the crowd, attracting few gazers, few admirers.”1↤ 1 Alexander Gilchrist, The Life of William Blake (London, 1863), I, 3. Thus Gilchrist, near the beginning of his biography, described the insensitivity of the Victorians to the genius of Blake. Gilchrist was right, of course; but, as always in the history of Blake’s reputation, there was more to the story. Probably the two largest exhibitions of fine art in nineteenth-century England were the Manchester Art Treasures Exhibition of 1857 and that of the Fine Art Department of the International Exhibition of 1862 at London. Both of these great aggregations included works by Blake—a fact which has been noted only by “Gilchrist,”2↤ 2 Gilchrist died in 1861, before completing his manuscript of the Life, and, presumably, before he knew about the Blakes at the International Exhibition. Therefore, he himself wrote only about the Blakes at Manchester, in the passage already quoted. But in William Michael Rossetti’s Annotated Catalogue (which, with Dante Gabriel Rossetti’s Selections from Blake’s poems, comprised the second volume of the Life) all seven of the works that were exhibited bear notes to that effect. When the Life was revised for a second edition in 1880, brief sentences were added, where appropriate, to the biography proper, to indicate that the pictures discussed had been sent to the International Exhibition (Life I, 57, 274). Blake’s participation in the exhibitions has been noted, elsewhere, only in catalogues, in notes to specific pictures, as part of their history. 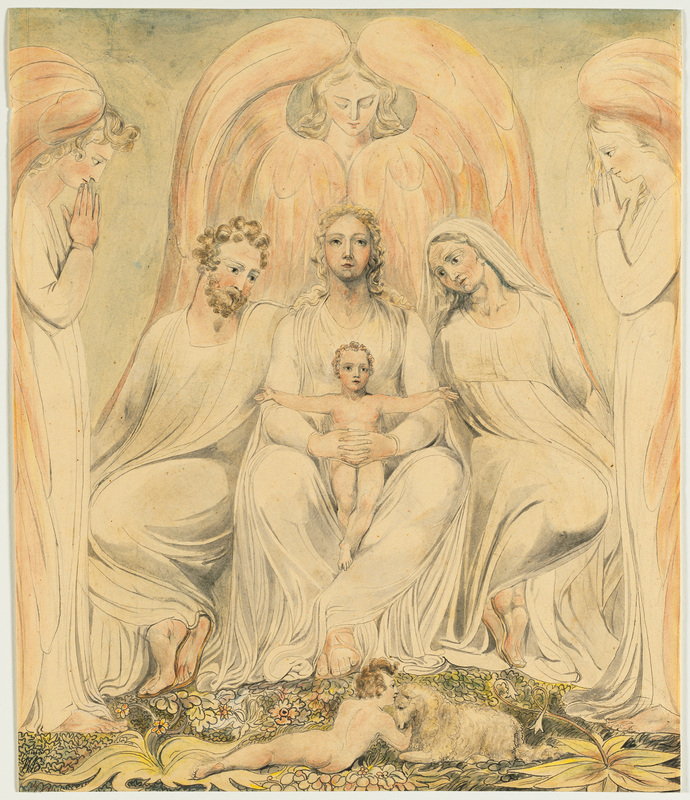 See, for example, The Tempera Paintings of William Blake (London: Arts Council of Great Britain, 1951), pp. 15, 26. Nothing about Blake’s part in the exhibitions is included in either of the two full-scale Blake bibliographies. and which bears retelling: for, taken together, the seven works by Blake that were displayed (two at Manchester, five at London) might have been seen by some three million people in all—a mass audience, even by today’s standards.3↤ 3 One million fifty-five thousand people attended the Exhibition at Manchester. I have no attendance figure for the International Exhibition, but I think it fair to assume that it would have been at least double that for Manchester, considering the difference in location, the broader nature of the London exhibition, and the fact that it lasted two weeks longer than that at Manchester. A figure such as that, while conjectural, should surely raise questions about the usual assumption that the Blake Revival, begun by Gilchrist, “introduced Blake to a mass audience for the very first time, both as an artist and as a poet.”4↤ 4 G. E. Bentley, Jr. and Martin K. Nurmi, A Blake Bibliography (Minneapolis: Univ. of Minnesota Press, 1964), p. 15. Not only was Blake’s work presented at the exhibitions, but also, in some of the literature associated with them it was mentioned, even discussed. Owing to the exhibitions, then, we may now add seven new items to the scant number of references to Blake between the time of his death and the publication of Gilchrist’s Life. (See the Appendix below.) These are: references to Blake in the Official Catalogue of each exhibition; in a Handbook to each exhibition; and in two periodical notices of the International Exhibition. Their value is not simply in their rarity, of course, but in the glimpse they give us of the critical response, or lack of it, to some examples of Blake’s art—at the only public showings of his painting between 1812 and 1876. The common ancestor of both the 1857 and 1862 exhibitions was the Great Exhibition of 1851, conceived in England and dedicated to the promotion of industry and the improvement of design in manufactures. As Prince Albert had been the guiding spirit behind that first and most successful of international exhibitions his judgment was naturally sought by the Manchester Committee, whom he influenced in favor of a national, rather than international, exhibit, one whose sole purpose would be to educate the public taste in art, thereby to create a demand for better design in manufactures. It was to be a gathering of the finest works held by private collectors in England. The Queen and Prince Consort led the way with generous loans from their own collections; soon, the Committee received twice as many offerings as they were able to use. Prince Albert opened the Exhibition on May 5th in the Blakean faith that “art is the purest expression of the state of mental and religious culture, and of general civilization of any age or people.”5↤ 5 “The Exhibition of Art Treasures at Manchester,” Art Journal (June, 1857), p. 187. For the next five and a half months the two “modestly tinted” Blake paintings gazed at visitors from the walls of Manchester’s Old Trafford. 1 “Oberon and Titania.” Private Collection. 2]. Both paintings are included in W. M. Rossetti’s Annotated Catalogue in the second volume of Gilchrist’s Life. William Russell’s collection is briefly and uninformatively described by Dr. Waagen in Galleries and Cabinets of Art in Great Britain. 7↤ 7 Dr. [Gustav Friedrich] Waagen, Galleries and Cabinets of Art in Great Britain (London, 1857), a supplement to Treasures of Art in Great Britain, 3 vols. (London, 1854). Dilke is, of course, Keats’s friend, an early collector of Blake’s work. 2 “Vision of Queen Catherine” (“Queen Katherine’s Dream”). Reproduced by permission of the Fitzwilliam Museum, Cambridge. Do not be deterred by the strangeness of Blake’s work, or the sadness of Dadd’s, from looking closely into both. Both were mad, but the insanity of Blake was of the kind separated by a thin partition from great wit. It was rather from preponderance of the imaginative faculty that he must be classed among lunatics, than from any ruin of mind such as hurried poor Dadd into parricide. Blake’s fancies were lovely rather than terrible. He was poet and musician as well as painter. If his music was like his verse, it must have been among the sweetest ever written. The author quotes “To the Muses” in full, with great admiration, and then offers some biographical details, including the usual account, from Cunningham, of Blake’s serene and pious death. He continues, in some confusion: ↤ 8 A Handbook to the Water Colours, Drawings, and Engravings, in the Manchester Art Treasures Exhibition (London, 1857), pp. 12-13. I have not been able to check the Manchester Guardian for the original article in which, presumably, Blake was mentioned. 3 “Christ in the Lap of Truth” (“The Holy Family”), watercolor drawing. Reproduced by permission of the Cleveland Museum of Art, John L. Severance Fund. 4 “Joseph ordering Simeon to be bound.” Reproduced by permission of the Fitzwilliam Museum, Cambridge. first of these was listed as an oil painting, the next three were watercolors, the last a tempera listed with the watercolors. All of these paintings were entered by Rossetti in the Annotated Catalogue; all but one were discussed in the biography by Gilchrist. Christ in the Lap of Truth, wrote Rossetti, is “the interesting and characteristic, though not salient, picture which was rather concealed than displayed at the International Exhibition.”10↤ 10 Gilchrist, Life (1863), II, 211. 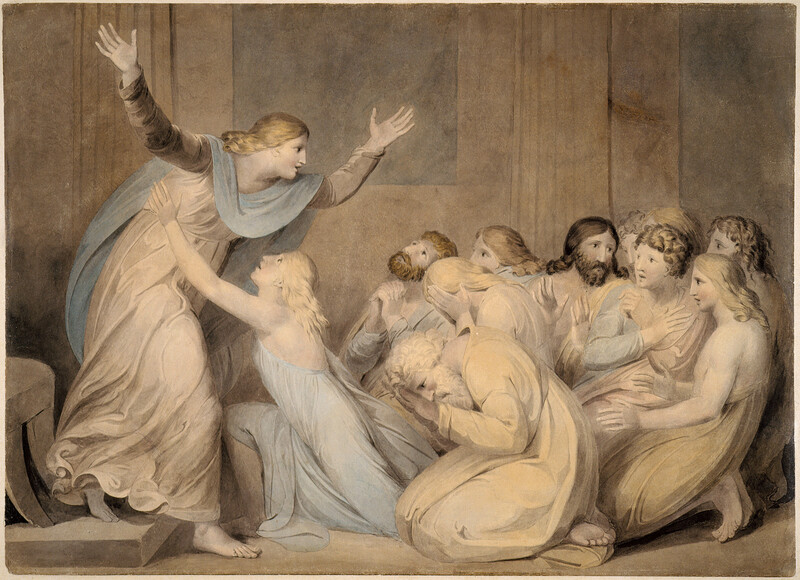 Sir Geoffrey Keynes, in The Tempera Paintings of William Blake, states that Christ in the Lap of Truth is a tempera, “erroneously described as an ‘oil picture’ by Rossetti”; however, the true identity of the painting of that title exhibited in 1862 remains uncertain. 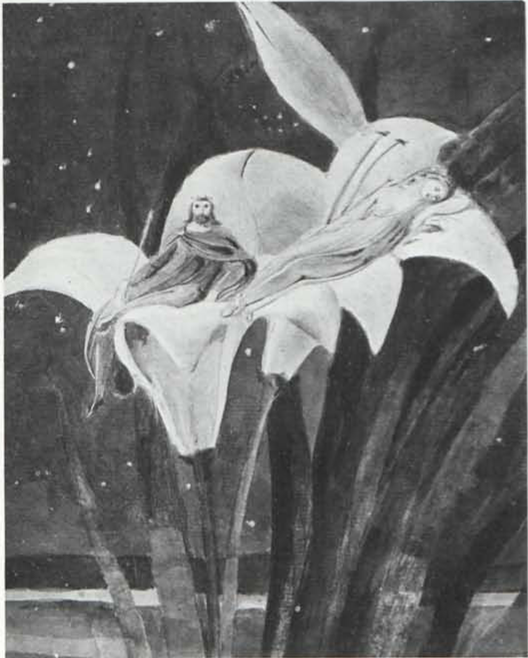 A watercolor with the title “Christ in the Lap of Truth” is reproduced in William Blake’s Illustrations to the Bible (Trianon Press, 1957) as #104. The same picture, entitled “The Holy Family: or Christ in the Lap of Truth,” is described in The Blake Collection of W. Graham Robertson, ed. Kerrison Preston (London: Faber & Faber, 1952), pp. 144-45. Robertson writes, “A larger version of this design was in oil . . . and in the possession of Lord Crewe.” Mr. Martin Butlin, Keeper of the British Collection at the Tate Gallery, has been kind enough to offer the following remarks about Christ in the Lap of Truth: “I have always suspected that the version of Blake’s ‘Christ in the Lap of Truth’ exhibited at the International Exhibition in London in 1862 . . . was the oil painting that was lent from the Crewe Collection to the Arts Council ‘Blake Temperas’ Exhibition in 1951, but withdrawn as probably not an original. Alternatively, the untraced picture, probably a tempera, ‘The Holy Family,’ described by Rossetti (1862, p. 230, no. 182) may have perished in Captain Butts’s sister’s attic. The water-colour version of this composition is now in the Cleveland Museum of Art.” There is no mention of it in the biography. Perhaps because more of his art was shown, more was written about Blake in 1862 than in 1857. In addition to the Catalogue listings there were four notices this time—few enough! and one of these was utterly inconsequential; but the consequential ones had at least got out of the Cunningham-anecdote rut that so much commentary on Blake had already fallen into, and was to continue in for many years to come. The two signed items are both by F. T. Palgrave, art critic, future anthologist and professor of poetry at Oxford—known to students of Blake’s reputation as one of the early admirers and collectors of Blake’s work.11↤ 11 For Palgrave’s early interest in Blake, see Gwenllian F. Palgrave, Francis Turner Palgrave: His Journals and Memories of His Life (London, 1899), pp. 26-27. 5 “Joseph making himself known to his brethren.” Reproduced by permission of the Fitzwilliam Museum, Cambridge. works, which, take them all in all, no other water-colourists in this style have equalled. 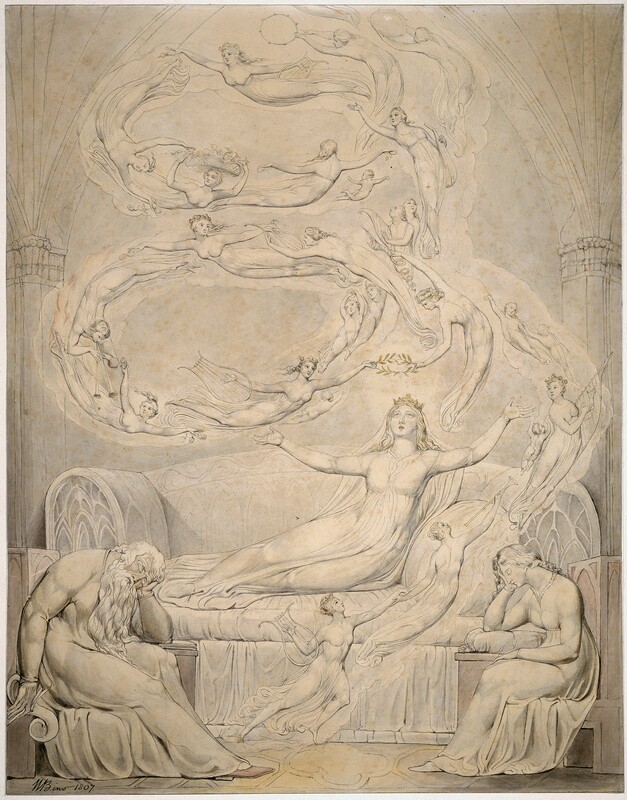 But it is hardly as art that the strange creations of the visionary Blake appeal to us; the drawing and execution are rarely successful; it is in the force of the penetrative imagination that their value lies,—in their almost painful intensity,—in their sublime suggestions of some earlier world of patriarchal days, or the mysteries of spiritual and ecstatic existence. within certain limits, two of the most inventive and original designers in English art. Neither is here represented fully, but they may be compared in their rival illustrations of the Pilgrimage to Canterbury from the Prologue to Chaucer’s Tales. Blake’s work has more poetic penetration,—Stothard’s more poetical grace; he reaches greater completeness and balance in the whole, Blake goes to the heart of the matter where he succeeds (the Host, the Prioress), but misses much entirely. The contrast indicated runs through their whole life and genius; Stothard the man of boundless and practised fancy, Blake of restricted and intense imagination. 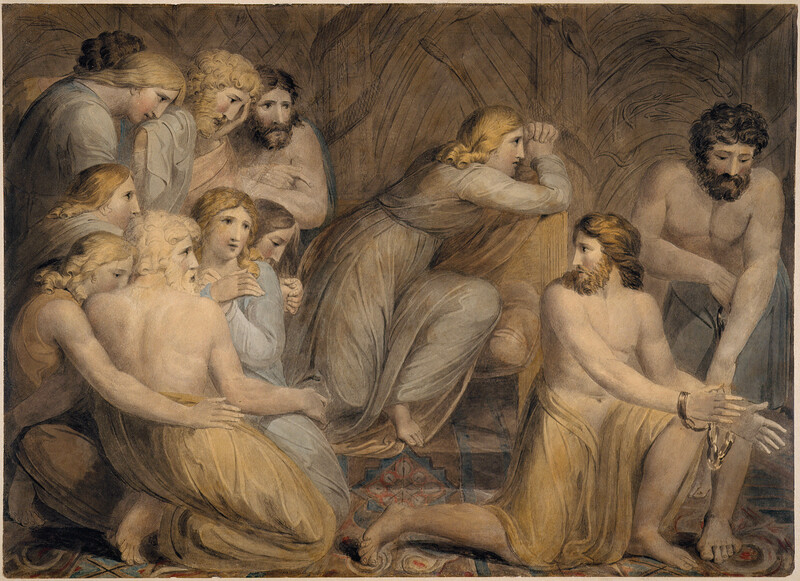 6 “Joseph’s brethren bowing before him.” Reproduced by permission of the Fitzwilliam Museum, Cambridge. The only one of the two periodical notices of Blake’s pictures that has any substance is a short passage that damns Blake to praise Stothard. Unfortunately, this judgment appeared in a periodical that might have been expected to produce something more than perfunctory or conventional criticism of an “unknown” painter, the influential Art Journal, the most important Victorian periodical in the field of the visual arts. The passage concludes: ↤ 14 “International Exhibition, 1862: Pictures of the British School,” Art Journal (July, 1862), p. 151. Last, and least, of the exhibition notices is one incomprehensible sentence in an Athenaeum article on the English watercolors. The sentence preceding it, about Dadd, is given here for whatever light it may shed on the meaning of the sentence about Blake: “Some works of exceptional interest will be found under the names [sic] of Dadd,—Moonlight in the Desert and A Rocky Valley. Blake’s transcendental fancies are freely seen.”15↤ 15 “International Exhibition. The English Watercolour Pictures,” Athenaeum, 17 May 1862, p. 663. This passage was reprinted, verbatim, in the popular compendium (“Uniform with the official catalogues”) entitled, What Do You Think of the Exhibition? A Collection of the Best Descriptions and Criticisms from the Leading Journals Concerning the International Exhibition (London, 1862), pp. 179-81. The compendium was edited by Robert Kempt. Freely seen? On that baffling note our glimpse of Blake’s pictures at the exhibitions may be, appropriately, concluded. An ideal art-lover who had seen the pictures and read the commentaries, while he might have been intrigued by the first, was then surely befuddled by contradiction between critics about first principles, such as whether Blake’s imagination was “lovely” (Manchester Handbook) or “morbid” (Palgrave). Nevertheless, something must have been gained from the little of Blake’s work that was seen, and the little that was written about that little. 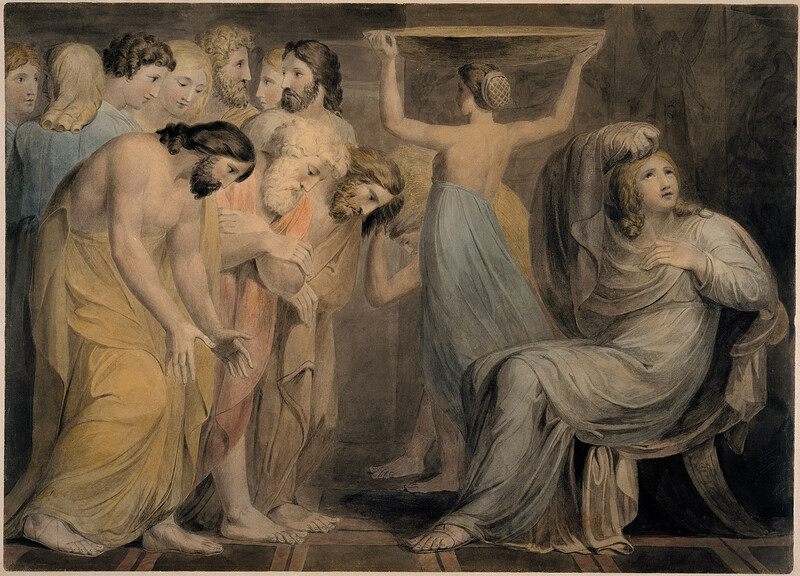 For present-day students of Blake, some questions persist: in neither exhibition did Blake appear among the engravers, although he had been known primarily as an engraver during his lifetime, and the collections of engravings were supposedly exhaustive (especially at Manchester). Those pictures that were hung did not show Blake at the height of his powers—another curious circumstance, when we consider that some excellent Blakes had already been “collected” and that there were persons with influence in the “art world” who knew perfectly well what Blake could do. In sum, we discover here, as at other times throughout the nineteenth century, a highly mysterious compound: first, we find a surprising general neglect of Blake, and then, considering that neglect, we meet with some equally surprising specific attentions. New references to Blake in connection with the Manchester Art Treasures Exhibition of 1857 and the International Exhibition of 1862. The arrangement is chronological. Palgrave’s article (No. 4) is entered separately from the Catalogue itself (No. 3) in order to distinguish it from the list of Blake paintings contained in the Catalogue. 1. Catalogue of the Art Treasures of the United Kingdom. Collected at Manchester in 1857. Nos. 130 and 130a. 2. A Handbook to the Water Colours, Drawings, and Engravings, in the Manchester Art Treasures Exhibition (London, 1857), pp. 12-13. 3. International Exhibition of 1862. Official Catalogue of the Fine Art Department [corrected, 1862]. Nos. 221, 965-68. 4. P.[algrave], F.[rancis] T.[urner], “The British School of Water Colour Painting,” International Exhibition of 1862. Official Catalogue of the Fine Art Department [corrected, 1862], pp. 46-47. 5. Palgrave, Francis Turner. Handbook to the Fine Arts Collections in the International Exhibition of 1862 (London, 1862), pp. 65-66. 6. Anon. “International Exhibition. The English Water-colour Pictures,” Athenaeum, 17 May 1862, p. 663. 7. Anon. “International Exhibition, 1862: Pictures of the British School,” Art Journal, I (July, 1862), 151.